They needed an extra five minutes to do it, but the Tulsa Golden Hurricanes took down the UConn Huskies at home 61-59 in a sloppy contest by both teams to hand the Huskies their second conference loss in a row. Jalen Adams, who sat out against Houston with concussion symptoms, returned to action and didn’t miss a beat. He lead the Huskies with 18 points. At first glance, it looks like UConn (5-8, 0-2 The American) had a good first half from the floor—66 percent from three and 52 percent field goal shooting—but a deeper look at the stat sheet shows that the sample sizes are small. 12-for-23 from the floor and 4-for-6 from beyond the arc are what tallied up to the 28 points that UConn had at the half. And while the Huskies held Tulsa (7-6, 1-0 The American) to 37 percent shooting from the floor and 3-for-14 from 3-point range, they were still able to churn out 27 points in the first half to keep UConn on their toes. Adams lead the Huskies at the half with eight points. UConn’s post players, Amida Brimah and Kentan Facey, displayed strong defense to keep UConn in the game. 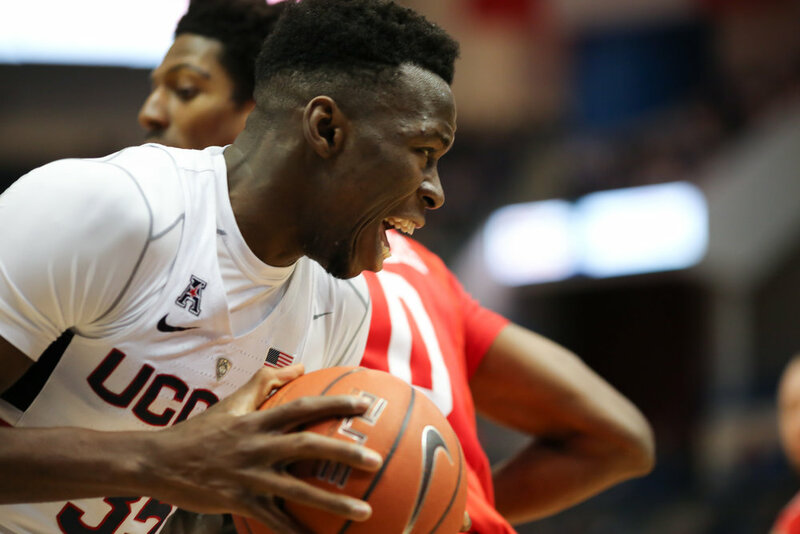 Brimah pulled down nine rebounds and amassed six out of 10 team blocks throughout the game, keeping possession alive on the offensive side and denying Tulsa scoring opportunities in the post on defense. Facey had 3 blocks and seven rebounds. It was a slow start for both teams. After UConn took a 5-2 lead in the opening two minutes, both teams went scoreless for four minutes until Tulsa broke the ice with a jumper. Both teams traded leads back and forth, with neither team having no more than a three-point lead at any given time. The second half started equally as slow and as sloppy as the first. UConn jumped out to a 39-32 lead in the first four minutes thanks to some aggressive guard play from Purvis and Adams, coupled with four missed shots in a row from Tulsa. Gaging the Huskies’ inexperience was not difficult for the Tulsa coaching staff. Three minutes later, after a series of missed shots and rebounds not capitalized on, the Golden Hurricanes switched to a zone defense that perplexed UConn and took them on a 12-0 run to take a 46-41 lead with just under eight minutes to go. The Huskies went nine minutes with only two points, both coming on free throws. With 7:33 to go, Purvis broke UConn’s scoring drought with a 3-pointer. After both teams went scoreless again for three minutes, Brimah pulled down a rebound in triple coverage after Christian Vital missed a corner three and slammed it home to knot the game up at 46 apiece. After Tulsa’s Pat Birt, who had previously missed all six of his 3-point attempts, drained a three to give Tulsa a three-point lead with three minutes to play, Adams scored six straight points for the Huskies to give them a 54-51 lead with two minutes left. In the sequence that followed, Adams notched his 18th point of the game to give UConn a 56-54 lead, but after a controversial no-foul call on Adams that kept UConn’s lead at two, Tulsa’s Jaleel Wheeler nailed a hook shot in the final seven seconds to send the game into overtime. As the theme went, neither team would score for the opening three minutes until Vital broke the ice with a 3-pointer, his first three of the day that brought his point total on the day to nine. Immediately, the Golden Hurricanes flew down the court and hit a layup to make it a one point game. Exploiting some confusion on the part of UConn’s defense, Tulsa essentially made a long pass down the court, easily banking in the go-ahead layup to give Tulsa the late lead. In the next minute, both Adams and Purvis missed threes that would have given UConn the lead. After intentionally fouling Birt, who made one of his two free throws, Adams missed a clean pull-up three that gave Tulsa a 61-59 overtime victory. The Huskies go into the new year with a 0-2 conference record. They’ll take on Memphis on Thursday, Jan. 5 at the FedEx Forum in Memphis, Tennessee. Tipoff will be at 7 p.m. ET.